We often get asked, “How much a round the world trip or travelling long-term cost?”… and the answer isn’t that simple. – The countries visited: your budget will not be the same if you go to the United States or if you go to Vietnam. – The comfort you’re after: are you willing to take longer flights with more stopovers and maybe leave in the middle of the night to save money? – The type of accommodation: a basic room is ok for you (you just want a place to sleep, especially after a long day walking) or are you looking for a place to relax? – The season: travelling in high season is much more expensive than in low season, but the weather will be less favorable. You need to define all of these before you can start thinking about the budget. In this post, I will first show you the actual budget of our round the world trip . Then, you will get some tips to help you define your budget, along with more information on our expenses. A / How much does a round the world trip cost? B / Budgeting, where to start? If you’re at the budgeting stage, I assume the list of countries you’re planning on visiting is finalised, or nearly there? Let’s look into the daily budget for each of these countries. The cost of travelling in some countries has increased dramatically in the last years (it’s the case of Myanmar). 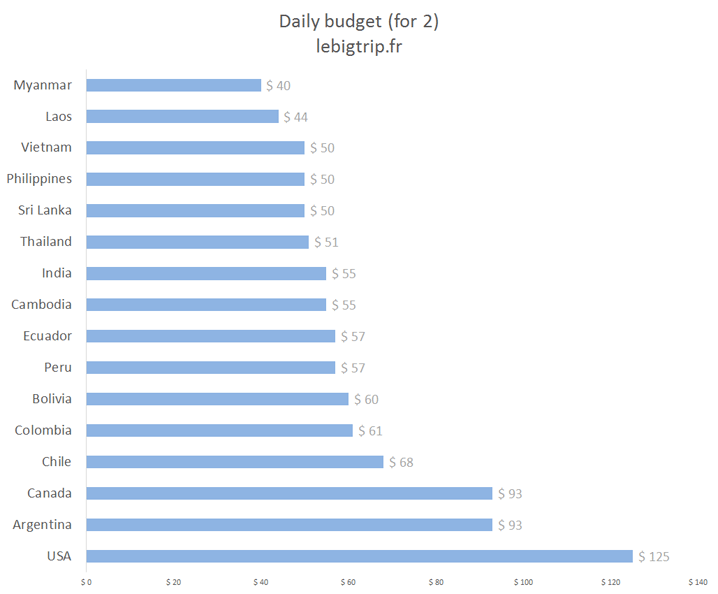 For that reason, it’s good to get an idea of the average daily budget you need for each country before you leave. Some people we met had to cut short their travel because of bad planning… and I’m sure you don’t want that. I’m not trying to freak you out here but it’s good to be prepared. 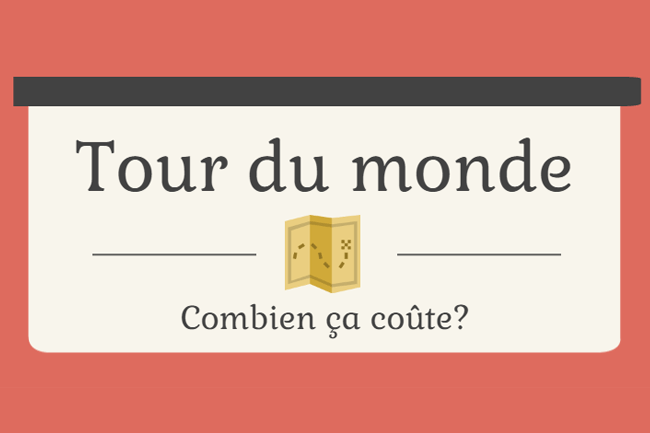 – using travel guides: lonely planet, rough guides, le routard (French guide), … They will give you an overall idea of the daily budget needed. There is no simple solution to get that data. Some websites can give you an idea of the daily budget needed, but there are so many variables to consider that it is better to spend a little time defining the budget yourself, based on different sources. The below graph shows our daily budget, for 2 people. It includes local transport, food, accommodation, and some side expenses (a few presents, stamps…). United States – In order to visit some of the National Parks: we rented a car, spent 16 nights in a tent (camping equipment rental and cost of camping included). Then, we rented a van and paid camping spots for a week. South America – We mainly slept in dorms and often cooked our meals. We have not been to the Galapagos (wasn’t in our budget for this time). Asia – We always headed for the cheapest options (hotels, meals, activities …). Even if we were very careful with our budget, we did a few great activities like scuba diving, paragliding, … but we avoided the ultra expensive ones like hot air ballooning. Some visas can be quite expensive. It is best to check their prices and confirm when you need to get them at the same time. Some visas must be requested in advance, others at the last minute, just before arriving in the country and the other can be obtained once you land in the country (at the airport). With our passports, we were lucky not to have to pay visa in South America. – travel vaccines (the cost depends on the shots you need to get) – We spent $760 on vaccines. We spent $1,500 on equipment and travel clothes for 2 people. – our backpacks. Btw they’re amazing, I’ll speak about these in an other post. We already had a DSLR, lenses and a backpack for the camera, so these are not included in the RTW budget. I’ll give you more detail on these in a future post. If you haven’t freaked out yet and still intend to go on a rtw trip, it’s time for the next big task: compare flight tickets. These tickets are offered by alliances (Star Alliance, One World, …) and some airlines (Emirates, Air New Zealand …). It is usually cheaper if you go through specialised agencies such as Voyageurs du Monde , Zip World , Connaisseurs du Voyage. Prices vary depending on the number of continents, number of stopovers and dates you intend to fly. You deal with specialists, so they understand your needs and can help you define your trip. The ticket is valid for one year. It has to be used within a year: that one goes into the pros and cons sections. If you are flexible, having this one year limit can be a hassle. The number of countries is fixed and they generally can’t be changed if needed. Some companies charge a fee in case of date change. Everything is in the title: you manage everything and compare the prices of tickets as you go. 100% flexible and you can buy low-cost plane tickets when needed and when the prices are advantageous. You can change your itinerary at any time. You need to be organised and buy flight tickets a few weeks/months in advance to get a good price. If you wait until the last moment, this option might get more expensive than a round the world ticket. We didn’t go for the RTW ticket option because we didn’t need to go through Australia and New Zealand (we had already visited those countries). All options made us go through Oceania, so the tickets were too expensive for what we wanted to do. We took 2 return tickets: one to go to Asia and one to go to South America. This allowed us to have a break back home, in France … and that was great. We were glad to be pampered by the parents for a few days. We added flight tickets as we needed. You can go through travel agencies to compare prices of tickets with additional stopovers. We bought ours through Flight Center and flew with Royal Jordanian and Jet Airways. Return ticket Bangkok – Yangon, Air Asia $400. We had to fly as the land borders were closed. We flew with Cebu Pacific Air. 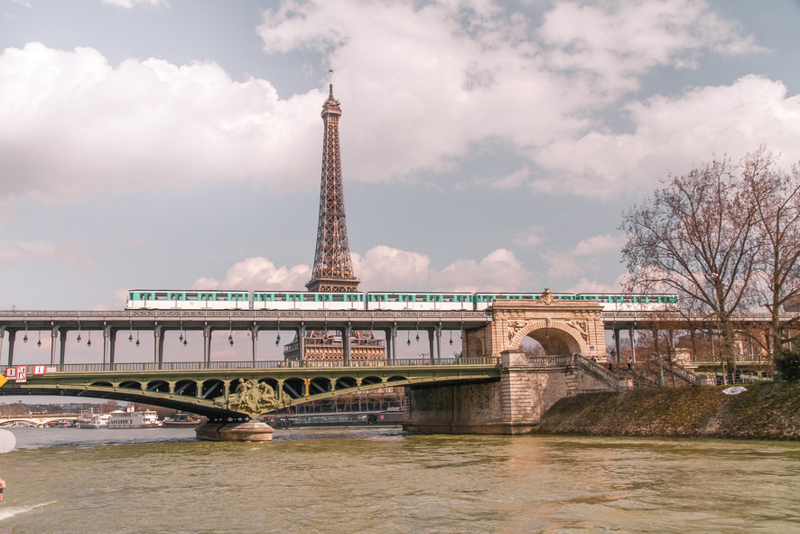 Lyon – Buenos Aires – Bogota – Paris, $2,015 with Iberia. Unusual huh ?! Finally, we did not use our return ticket (Bogota-Paris) because we wanted to add an extra month and a half to our trip. Iberia has allowed us to change neither the date nor the destination (unless we paid more than $1,000) … In addition, the customer service is usually unreachable. I highly “recommend avoiding” this company. Bogota – Vegas – San Francisco – New York, $1,120 with United Airlines. Total: $6,995 for 2 people. Don’t forget to include anything else you would need: contact lenses, cost for dives… Do you need to buy a new camera, or binoculars to spot animals in Costa Rica or Yellowstone? Take the time to update the list of things you need to purchase for the trip, based on what comes up. By now you should have a good idea of your final budget. What if the total is too high? – stay longer in each country, transportation adds up to approximately 40% of your budget. Spend more time in one place will allow you to spend less (you see what I mean?) … and have a break! – think couchsurfing, house sitting, woofing. It will allow you to spend less and get to know the locals. – travel in low season, some countries are very pleasant during that time: fewer tourists, everything is cheaper and easier to negotiate. Now you’re almost done. When you have finished, set a maximum. Otherwise, it’s too tempting to enjoy a massage every day under the pretext that it is cheaper in Thailand. Do not forget to keep some money aside for your return: to give you time to find a job, an apartment without too much stress… if this is not already managed. We used an Excel file created by a little adrift to monitor our budget. It helps you detail your previsions by category and helps you track your expenses. You can save it on your computer, if you’ll have one during your long-term travel, or save it on google drive. – If you have a tight budget: you will need to take that time and write down all your expenses. It will allow you to quickly see where you spend the most and so pinpoint the areas where you can save. – Note your expenses on a daily basis: no need to split by type (accommodation, food …), only write down the total amount. We followed our budget very closely in Asia … we were in the cheapest hotels, eating in the cheapest restaurants … Then we realised we were going to do a round the world trip once in our lives and wanted to enjoy ourselves and have great moments. So have fun, create memories and remember that the budget shouldn’t become an obsession. This post was meant to be shorter, but there are so many things to cover. I hope it has helped you set your budget. Feel free to comment if you have any questions or just want to say hi. Do not hesitate to share this post if you found it interesting.